There is growing evidence that the drug companies have helped to cause the opioid overdose crisis due to their aggressive marketing, according to criminal justice expert Paul Brakke, who has published seven books on criminal justice topics through American Leadership Books. He has previously cited a study published in JAMA Internal Medicine describing this connection. Now he has found even more evidence that points the finger squarely at the drug companies. As he notes, citing a report of this study in Vox, "We Now Have More Proof that Drug Companies Helped Cause the Opioid Epidemic" by German Lopez, the drug companies contributed most powerfully to the first wave of the opioid epidemic which has washed into America in three main waves. According to Brakke, in the first wave which started in the late 1990s through the early 2000s, doctors prescribed a growing number of opioids to reduce or stop pain. The result was that the drugs spread widely, and often they were misused or led to addiction -- not just among patients, but among their friends and family members. Additionally, teens took drugs they found in their parents' medicine cabinets. Plus many individuals who later became addicts or overdosed got their pills on the black market. "This is where the marketers played a major role in contributing to the epidemic, because they aggressively promoted the drugs to doctors, who then overprescribed drugs to their patients. After that not only did many patients become addicted, but others could easily access these drugs. The incentive for the drug companies was that they made more and more money, the more drugs they sold, regardless of how those drugs were used." Then, as Brakke notes, this first wave opened up the door to the second and third waves. This second wave of overdoses occurred in the 2000s as a result of a growing supply of heroin in the market, because drug dealers and traffickers found a new source of profit in the growing population who used opioids. These users were unable to get more pills from their doctor or and saw heroin as a cheaper way to get high from drugs. Then, most recently, the third wave has occurred because of fentanyl, which is an even more powerful and cheaper drug than heroin. But it is much deadlier because of its greater potency, and sometimes users mixed it with heroin, because it was cheaper. However, that also meant that users got a more powerful fix that often led to an overdose. "Unfortunately," says Brakke, "the drug companies have added to the problem through their aggressive marketing, despite evidence that the drugs weren't a safe or effective alternative to other painkillers on the market. And now a recent lawsuit against the maker of OxyContin shows how the drug companies have used this aggressive marketing to sell their drugs." As Brakke describes it, citing the Vox article, Massachusetts Attorney General Maura Healey filed a lawsuit against Purdue Pharma, which makes OxyContin. Among other things the suit complained that the company ignored excessive prescribing in the United States, although its staff was warned that the company should have reported the "pill mills" to the federal officials. Additionally, Brakke notes, other reports pointed to the very irresponsible behavior of the opioid companies, such as one by a group of public health experts in the Annual Review of Public Health. "According to this report," Brakke states, "the companies exaggerated the safety and benefits of their products. They also supported advocacy groups and education campaigns that promoted the use of opioids. Additionally, they lobbied lawmakers to loosen restrictions on being able to obtain the drugs. Not only Purdue was involved in this effort, but so were Endo, Teva, Abbott Laboratories, and other companies making these drugs." Unfortunately, the result was that addiction and overdoses increased as did opioid sales. "There's even a chart from the Annual Review of Public Health that shows this direct connection. As opioid sales rise from 1999 to 2010, so do opioid deaths. What makes this connection even worse is that the drugs are not only deadly, but they aren't as effective against pain as Purdue and the other drug makers claim." Why not? Because, as Brakke points out, citing the Vox article, "There's only very weak scientific evidence that opioid painkillers can effectively treat long-term chronic pain as patients grow tolerant of opioids' effects. But at the same time, much evidence shows that prolonged use can lead to very bad complications, which include a higher risk of becoming addicted, overdosing, or even dying. 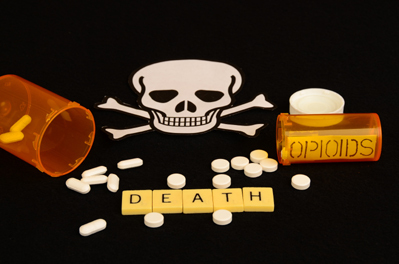 In short, the risks and downsides of taking opioids are much greater than any benefits for most patients suffering from pain -- or for anyone taking opioids for that matter." At least, there has been the beginning of a crackdown on this aggressive marketing by drug companies, according to Brakke. For example, in 2007, Purdue Pharma and three top executives were hit with over $630 million in federal fines for misleading the public with their advertising. In addition, the three executives received criminal convictions, though they only received three years of probation and 400 hours of community service. "And that seems like a slap on the wrist," says Brakke, "when you consider the many lives lost due to their marketing." Still Brakke points out that changing public sentiment is in the wind, leading Purdue to announce that it would stop marketing opioids to doctors. And now there may be even more of a crackdown. For example, one Cleveland judge combined several lawsuits against opioid companies in order to seek a big settlement agreement, which would not only result in a financial settlement to pay for treatment for addicts throughout the U.S. but would also restrict marketing by these companies. And on January 31, still another suit against Purdue Pharma was filed showing that the company secretly pursued a plancalled "Project Tango," to sell both opioids and drugs to treat opioid addiction, while the wealthy owners on the board obtained more than $4 billion in opioid profits. "This crackdown is more needed than ever," says Brakke, "since restricting marketing could help ameliorate the current opioid crisis and avoid a repeat of this crisis in the future." Brakke has become especially concerned with finding a way to overcome this opioid crisis because of his research about it for the past year, which he has reported in a chapter in Crime in America and in Dealing with Illegal Immigration and the Opioid Crisis. He is also planning a future more in depth analysis of this problem. In writing his books and working as a consultant, Brakke brings to the table a unique conservative approach to crime, criminal justice, and American society. That's because usually liberals discuss ways to reform the system through more of a social welfare approach. But Brakke's approach is more based on an economic business model of doing what works most efficiently to both cut down costs and create more productive citizens. He is now bringing his unique approach to his forthcoming book Fractured America, dealing with the many divisions that are tearing America apart and how to heal these divisions. It will be published in early February.